Move through the divorce process easily and efficiently. 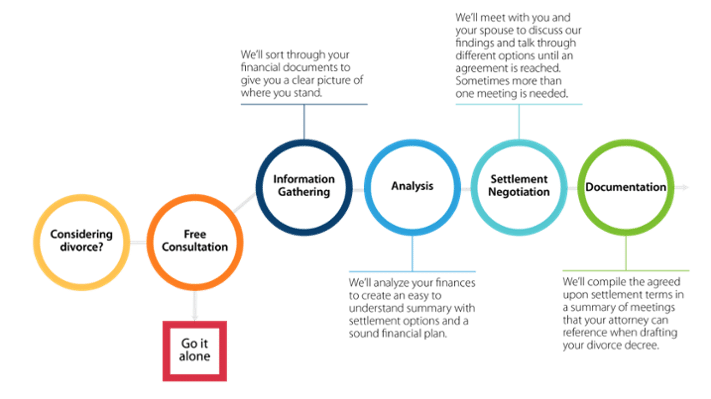 Sound Divorce Solutions provides financial expertise during divorce for individuals and couples who are seeking a more amicable divorce. We have advanced training in all financial aspects of divorce and divorce mediation, creating options and settlement strategies that make sense for both parties. Get divorce financial planning expertise when you need it most. Divorce can be a financially and emotionally draining life event. It typically occurs at the end of several months or even years of trying to live within a difficult and unsatisfying relationship. This means divorce often takes place at a time when both spouses are generally exhausted, confused, and feeling at their most vulnerable. At Sound Divorce Solutions, we understand this environment and we know how to provide clarity and direction to clients who are seeking a neutral expert to help them through this difficult time. We partner with individuals, couples, or professionals to serve as a valued team member, providing litigation support, preparing detailed budgets and reviewing and analyzing different settlement options. In the beginning stages of exploring whether or not to pursue a divorce, it is important to take a few steps to ensure the best financial outcome. If you decide to move forward, Sound Divorce Solutions will work with you at this stage to help you learn what steps to take before you decide to divorce, and how to position yourself for the future. Sound Divorce Solutions will serve as your trusted team member and help you work toward a settlement that supports your lifestyle, now and in the future. If you’re working with a mediator, we can compile data to help guide you toward a solution that works for both you and your spouse. If you’re working with an attorney, we can provide the written documentation that your attorney would need to negotiate with your spouse’s attorney or at trial. Our comprehensive analysis minimizes mistakes related to hidden assets, improperly valued assets, or incomplete information and errors. In addition, we can provide you with a look at how a possible settlement will affect your life now, and 10-30 years into the future. During the divorce process, you and your spouse must make decisions related to spousal maintenance, child support, tax issues, the division and sale of property, and retirement funding. We’ll help give you the confidence to make these decisions without regret. Once your divorce is final, there are still more decisions to be made. Rather than waiting months after your divorce is final, let us help you get planning now so that you can begin the next stage of your life feeling confident and in control. Learn more about the financial planning steps you should take after your divorce. Sound Divorce Solutions can work as a neutral with a couple who is amicable and wants to save money. Our pricing is transparent, flat-fee pricing, based on the complexity of your finances. Why waste your hard-earned money in an expensive court battle? We offer a mediated solution with financial expertise throughout the process. We will help structure a creative settlement option that allows both parties to keep more of their own money. One of our family law attorneys provides document preparation and filing so you can have an amicable resolution without ever stepping foot in a courtroom. Sound Divorce Solutions makes sure that the settlement decisions you make will be fully educated and informed. We guide you through the financial challenges related to divorce so you can feel confident in your future. We’ll give you the advice and expertise you need to reach a settlement that makes sense for you and your lifestyle, and eliminates surprises related to taxes or division of property or assets. Pension Valuation: $250 flat fee. Post-Divorce Transition Assistance: $250 per hour. (Account transfer and consolidation, property settlement transfers, divorce planning and guidance). Maintenance Buyout Calculations: $150 flat fee. When maintenance is agreed to but would prefer a lump-sum payment upfront or a combination of maintenance and lump sum. Administrative Time: $100 per hour. QDRO stands for “Qualified Domestic Relations Order”. A QDRO is necessary to divide retirement plan assets in the divorce process if you are awarded a share of your former spouse’s retirement plan. You need a QDRO to implement that award in order to receive your money. The QDRO process can be complex and confusing for divorcing couples. Some plans have their own QDRO forms, and others do not. A QDRO also allocates tax responsibility for the division of a retirement plan. So it’s imperative that you work with someone who is qualified to explain all of the nuances related to this process. Sound Divorce Solutions is a QDRO facilitator for a flat fee of $625. We will ensure that you understand the process, are clear about your options, and that a qualified QDRO attorney draws up your documents to be pre-approved by the plan before filing with the court, saving you time and money. We can also structure your divorce settlements so there are as few QDRO forms as possible. Although your divorce is final, there are still many things that need to take place to put you on a sound financial path. Rather than waiting months after your divorce is final, we can start planning now so that you can begin the next stage of your life with peace of mind. Learn more about the financial planning steps you should take after a divorce.